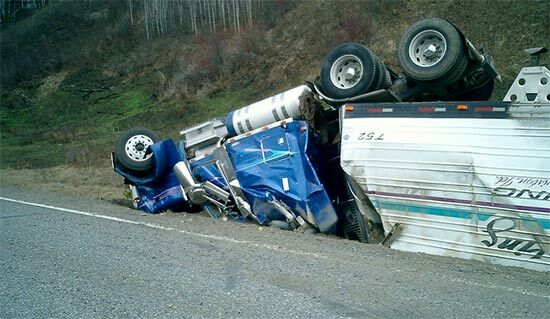 In order to maintain high safety records for trucks in service on public roads most government worldwide have created laws that limit the amount of time that truck drivers can be behind the wheel of their vehicles. GPS truck trackers give managers and corporations the tools needed to monitor truck driver’s time behind the wheel and make provisions for deliveries when a driver is approaching a critical limit. What are the guidelines for driver’s time behind the wheel? Currently, regulations for truck driver’s time behind the wheel limit their service to a set maximum hours straight, or a combined total work day of a slightly higher maximum within 24 hours. Additionally, there are breaks and mandatory rest periods before the driver can resume their duties behind the wheel. GPS truck trackers monitor the location of each truck and will alert the head office if the truck moves during a required rest period and can ensure the driver is following all mandatory driving and resting requirements when behind the wheel. Why do laws limit the driving time? A study conducted by the Insurance Institute for Highway Safety showed that when drivers become fatigued and have spent more than eight hours driving the have a 2x greater chance of being involved in an accident. Additionally, a follow on study looked at truck drivers who maintained a log book of their work but made incorrect entries were more likely to be the cause of an accident. With GPS truck trackers managers do not have to rely on manual logbooks, these convenient monitoring devices will have exact times, locations and durations available at all times. Limiting time behind the wheel and maintaining correct log books are two challenges with maintaining a fleet of trucks in service. The pressure to make deliveries and provide good customer service combined with the desire of truck drivers to get one extra delivery to earn their fees put pressure on all involved. These desires conflict with safe driving habits and responsible driving times but with GPS truck trackers you can remove the human factor from this equation and go strictly by the numbers.